James Nunley, M.D. is the J. Leonard Goldner/ Billy Jones Endowed Professor and Chairman Emeritus of the Department of Orthopaedic Surgery at Duke University Medical Center. 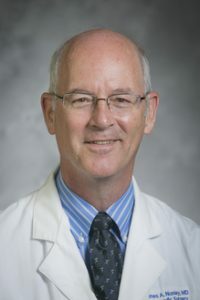 Dr. Nunley has served as President of the American Society of Reconstructive Microsurgery, the American Orthopaedic Foot and Ankle Society, the Eastern Orthopaedic Association, the Southern Orthopaedic Association, the Orthopaedic Learning Center in Rosemont, Illinois, the North Carolina Orthopaedic Association, the North Carolina Society for Surgery of the Hand, the Hand Forum, and the Southeastern Hand Club. He was awarded honorary membership in the Israeli Foot and Ankle Society, the Swiss Foot and Ankle Society and the Hellenic Orthopaedic Society Dr. Nunley has given more than 340 national and international presentations, and has authored more than 200 publications in peer-reviewed journals. Dr Nunley has authored two textbooks and sits on the editorial board of several Orthopaedic journals. Dr. Nunley has been the recipient of the prestigious American/British/Canadian Traveling Fellowship presented by the American Orthopaedic Association, and The Goldner Award for the most outstanding research paper presented at the American Orthopaedic Foot and Ankle Society. Additionally he was presented with the Bassett Award as the outstanding teacher by the Duke orthopaedic residents. Graduating from Duke University with a BS degree in Chemistry, he then attended Tulane University Medical Center in New Orleans, Louisiana, completing his MS/MD degree, Dr. Nunley continued on to the University of California, Los Angeles to train for two years in general surgery, before completing his four year orthopaedic residency training at Duke Medical Center in Durham, North Carolina. Dr Nunley then joined the Duke faculty in 1980. Dr. Nunley’s research is related to sports injuries of the foot and ankle, arthritis of the foot and ankle, and vascularized bone grafting.